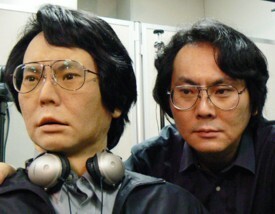 Geminoid is a remote-control doppelganger droid designed by and modeled after Hiroshi Ishiguro, professor at Osaka University and researcher at ATR Intelligent Robotics and Communication Laboratories. Robot Watch has released some short videos, which you can see at the links below. Video format is WMV. Video 1: Ishiguro introduces himself through Geminoid. Video 2: This segment shows Geminoid's facial movements. The telepresent Ishiguro explains, "When someone touches Geminoid, it seems as if I am the one being touched." Video 3: Geminoid (Ishiguro) doesn't like it when you touch his face. Video 4: Geminoid is programmed so that his head continues to move, even when not being specifically controlled. Video 5: Sitting next to Geminoid, Ishiguro discusses his research concerning "presence." In Latin, gemin means "twin" or "double," while -oid is a suffix indicating a "likeness to something else." Hiroshi Ishiguro would say that his Geminoid is like a twin. The body is a copy of Ishiguro's, and the shape of Geminoid's skull was created based on MRI scans of Ishiguro's head. And Geminoid shares some of his mannerisms. Geminoid's body, which was produced by Kokoro, makers of the Actroid line of fembots, has 46 degrees of freedom and is driven by a system of air compressors. The skin consists of soft, silicone rubber. Confined to a chair at the moment, the android is unable to stand up and move about on his own. Communication and power cables exit his rear end and snake through the shaft of the chair out of sight. It took 6 months of work to develop the body and about 2 to 3 months to develop the software. One of the purposes for creating Geminoid is to explore the concept of tele-existence -- to figure out what is needed in order to copy an actual human's "presence" so that he or she may exist in two places at once. "I wonder how possible it is to separate one's inner self and outer self, to create distance between one's body and soul," Ishiguro says. See more photos of Geminoid at the link below. NEC, NEC Design and SGI Japan have teamed up to develop KOTOHANA, flower-shaped terminals that use LED light to remotely communicate human emotions. Each KOTOHANA set consists of two flower-shaped terminals equipped with LEDs that change color according to the emotions of the person who owns the counterpart. Each flower contains a microphone that captures voice data for processing, the results of which are sent via wireless LAN to the other terminal, where it is expressed as LED light. KOTOHANA's Sensibility Technology (ST) emotion recognition engine, which was developed by SGI Japan with the cooperation of AGI, detects joy, sorrow, calmness and excitement in speech patterns. Happiness is expressed as yellow, sadness as blue, calmness as green, and excitement as red. Changing emotions are expressed through subtle color gradations and variations in light brightness. The product is still in the prototype stage, with the ST engine running on a separate computer connected to KOTOHANA. NEC plans to showcase KOTOHANA at CeBIT, the international trade show for information and telecommunications technology to be held from March 9 to 15 in Hannover, Germany.